Train operator Eurostar has urged the government to end a delay in funding a £60m interchange at London's new Channel Tunnel terminus. Eurostar has called on ministers to "immediately reconsider" the decision to withhold cash for a new Thameslink station at St Pancras, north London. The government backs the building of an underground box to house the station but has not rubber-stamped funding. The Department of Transport said it was committed to the new station. Eurostar director of communications Paul Charles said: "We would urge the Department of Transport to immediately reconsider how urgently this box should be fitted out." London Transport Users Committee claimed the existing Thameslink station could become dangerously overcrowded when Eurostar trains start using the redeveloped St Pancras in two years' time. A spokeswoman for the transport watchdog said: "We are worried about passenger safety due to the risk of overcrowding. "If they were going to start looking at other options they should have done that before." A spokesman for the Department of Transport said services would not be allowed to run if safety was at risk. 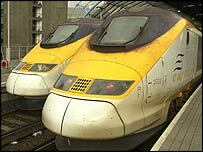 From 2007, Eurostar services to London will stop at St Pancras, instead of Waterloo, in order to free up domestic train routes into Waterloo.